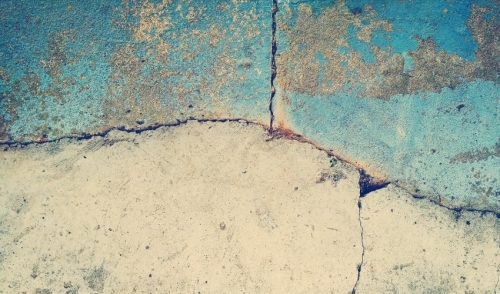 Concrete slabs crack, sink and settle because of bad base preparation. My company recently used a system called PolyLevel (foundationsupportworks.com/solutions/polylevel.html) to repair a cracked and sunken slab surrounding a swimming pool. The repair involved injecting a high-density polyurethane foam to lift and support sunken sections of the patio slab to create an even surface. The system is not strictly for patios and pool slabs. We’ve used it to raise interior residential slabs, and the density and expansive force of the foam can be adjusted and used to lift and stabilize large industrial slabs, and even roadways and airport runways. Here is a step-by-step description of the pool patio repair. Install injection ports. In this case, the outer edge of the slab had dropped several inches, creating a large crack that ran almost the full length of the pool and causing reverse drainage at the house foundation. In other areas, a series of cracks created several independent sections of slab that had sunk to several different levels, creating dangerous trip hazards. We drilled a series of ⅝-inch-diameter holes through the slab in a pattern determined by the area of the slab we needed to lift and how much we had to lift it . The white areas on the slab are hole locations, which in this case were about 3 feet apart and about 18 inches from the edge of the slab. (We typically keep holes at least 6 inches from an edge; any closer and the foam tends to ooze out the side.) Each hole is fitted with a plastic port designed to receive the foam injection nozzle . Inject the foam. Two separate liquids are pumped through separate hoses  to the injection nozzle , where they mix together. That triggers a chemical reaction that creates a high- density, expansive foam, which can be injected at temperatures above freezing, provided there is no frost in or under the slab. Raising the slab. As the foam is injected [5A], the slab slowly rises until it is flush with the adjacent concrete [5B]. Controlling how much and how fast the foam expands depends on two factors. One is the chemical mix, which can be adjusted before it reaches nozzle; the other is the technique we use to inject the foam. We begin injecting in short bursts to gauge how fast the foam is expanding and lifting the slab. The foam begins to stiffen quickly, but it doesn’t fully cure for 15 minutes, so there is a window of time in which to make adjustments and add more foam as needed. We’ve never had a problem with under- or over-filling, and over time we’ve developed several techniques that enable us to work to a tolerance of 1/16-inch. The simplest check is for the person controlling the nozzle to keep a finger or hand on the crack to feel when the surfaces are level with each other. In some cases, we also use a laser level to indicate when the slab has reached the desired height. Caulk and cleanup. On this project, we drilled and injected one section at a time, working our way around all of the sunken areas of the patio . After removing the injection ports, we sealed the holes with concrete, which leaves nickel-sized spots on the slab. We like to seal the cracks with Nexus Pro NP1 sealant to help keep water from passing through and getting under the slab, but we leave that decision to the homeowner. When we do seal them, we sometimes have to grind them a little to create a channel that’s wide enough to fill properly.